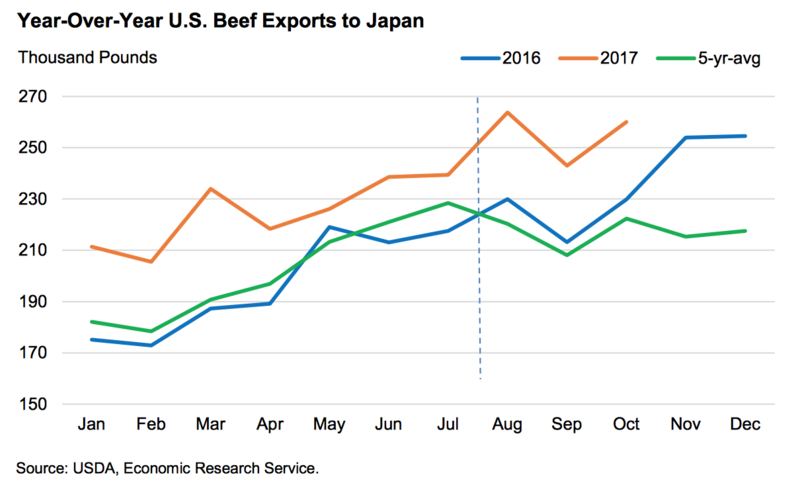 In the last few days, USDA’s Economic Research Service (ERS) and Foreign Agricultural Service (FAS) have released three separate reports that contain current information relating to dairy sector analysis in China, U.S. livestock trade, and the the U.S.-Korea Trade Agreement (KORUS). This update briefly highlights core points from the three USDA reports. 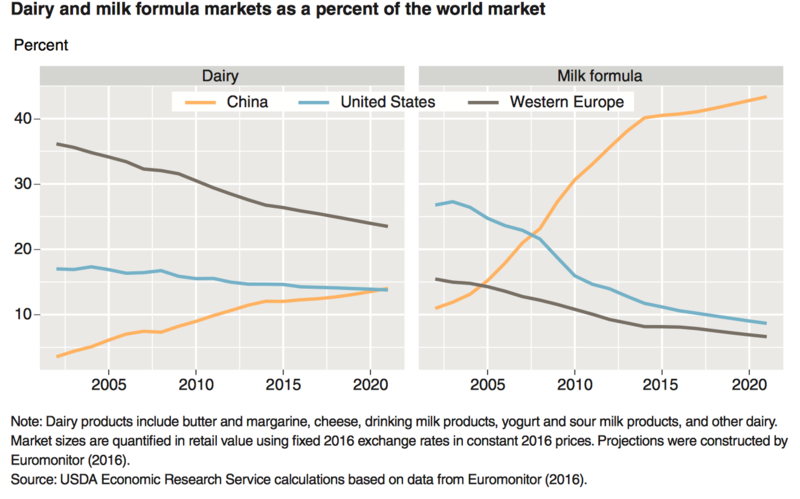 “China Dairy Supply and Demand,” by Elizabeth Gooch, Roger Hoskin, and Jonathan Law . USDA- Economic Research Service. LDPM-282-01 (December 2017). 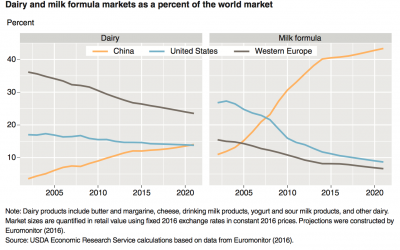 Demand for dairy products in China will likely continue to exceed domestic supply, and a quarter of the 2024 dairy market is expected to be satisfied by imported products. Focusing more narrowly on U.S. trade issues, the ERS report stated that, “The U.S. dollar-yuan exchange rate has put U.S. exports at a disadvantage relative to those from Europe and Australia, where the exchange rates have been more favorable. However, the United States remains one of the principal suppliers of agricultural commodities to China. 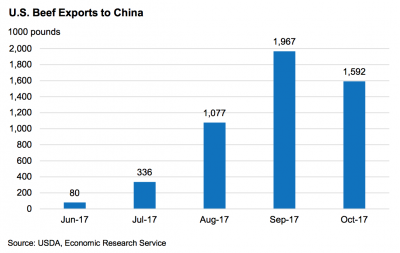 U.S. dairy exporters will likely benefit from the projected expansion of China’s dairy market, and U.S. exporters of feedstuffs, particularly inputs to China’s dairy industry, have already realized rapid growth in trade value. The ERS report indicated that, “In addition to increased exports to the top five export destinations, year-to-date October 2017 U.S. exports were also higher to Vietnam (+10.8 million pounds), Philippines (+4.9 million pounds), Chile (+4.8 million pounds), Indonesia (+4.3 million pounds), and China (+5.1 million pounds) from year-earlier levels. 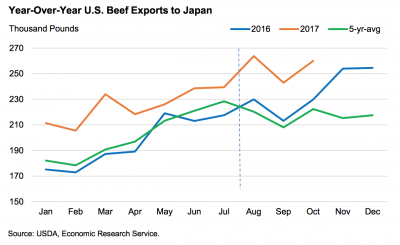 China lifted a 14-year ban on U.S. beef entering China in June 2017. 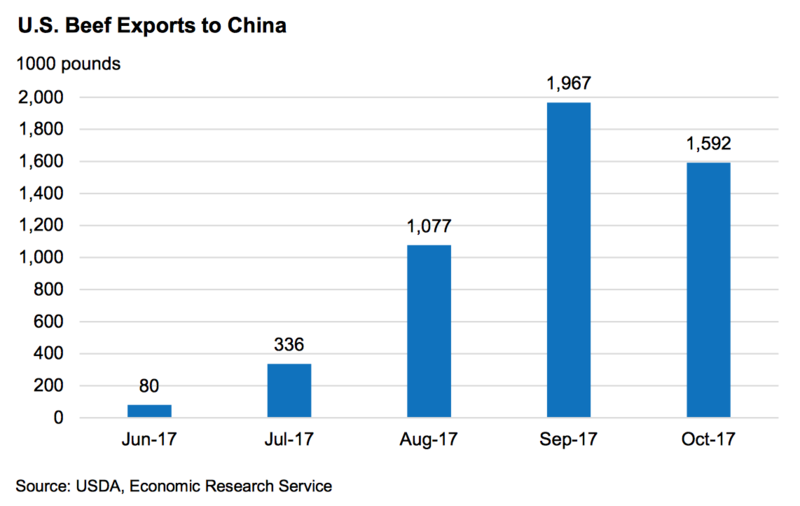 In recent months, exports have begun to approach pre-ban levels. “U.S. 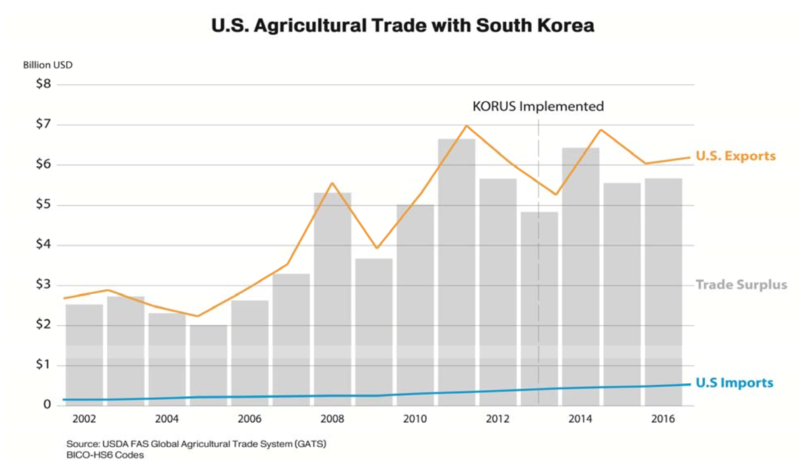 Agriculture Reaps Benefits of Free Trade Agreement with Korea.” USDA- Foreign Agricultural Service (December 18, 2017). 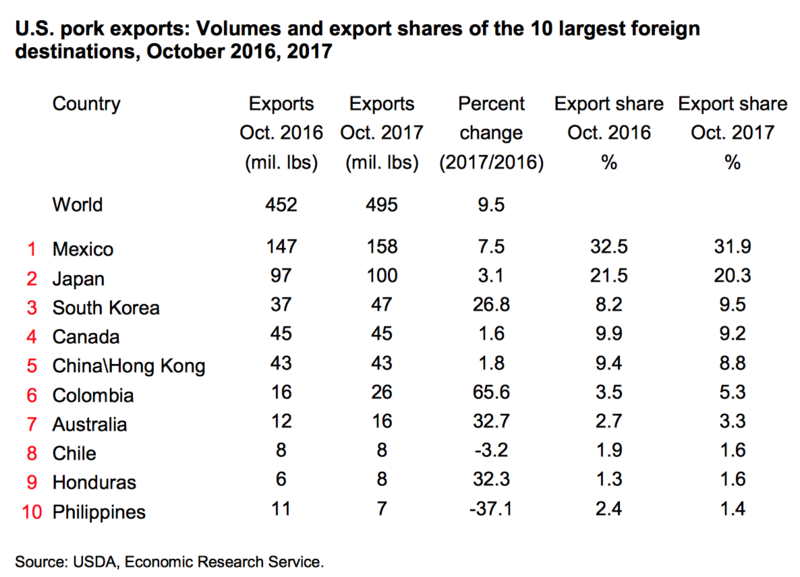 With a population of 51 million and a growing middle class, South Korea continues to be one of the top destinations for U.S. agricultural goods, ranking as the United States’ sixth‐largest market in 2016. The United States is South Korea’s top agricultural supplier, providing 28 percent of the country’s farm imports.